Mr. R Thiyagarajan has done B. Arch from REC, Tiruchirappalli and M.Sc. (Building Sc) from National University of Singapore. 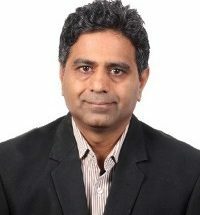 He has more than 25 years of working experience with leading practitioners in Singapore and India on a wide range of projects. He has worked on various projects like Institutional, Industrial & commercial etc., involved in design development, tender, construction documentation and contract administration in Bangalore. He has been involved in design and execution of various IT Parks, corporate offices, High-rise apartments and Industrial facilities. As associate director in RSP, Bangalore he led a large team of Architects & Engineers, overseeing the design, design development, construction documentation and execution of a large number of projects ranging from 1M sft to 4 M sft. Till date he has delivered more than 20 million sft of built up spaces. He is now heading DPA consultants (pvt). Ltd Bangalore. He has participated in BCA, Singapore study group representing RSP, to publish a set of design guidelines for precast concrete landed houses. He has presented a paper on ͚Innovative Construction Technologies – Building Envelope Systems͛ at the annual convention of Andhra Pradesh Real Estate Development Association (APREDA).